This stunning 18ct white gold diamond ring from the Forever Diamond collection, exclusive to H.Samuel, has a total diamond weight of 0.38 carat. The Forever Diamond has a unique flower cut made up of 73 facets, the result is exceptional sparkle and radiance. Each Forever Diamond has been independently certified by the GSI for colour, clarity, carat and cut. It's your guarantee of quality and beauty. 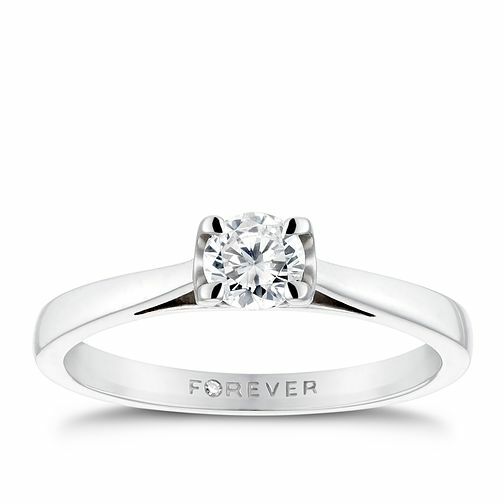 18ct White Gold 0.38 Carat Forever Diamond Ring is rated 4.9 out of 5 by 10. Rated 5 out of 5 by Anonymous from Beautiful and sparkly My fiance and I chose this ring together, on line and I couldn't be happier. I love it!! Rated 5 out of 5 by Anonymous from Dream!!!!! I got this ring as my engagement ring.Real beauty,amazing sparkly,stunning!!! !